Brings subtlety to trashing wireless networks. A penetration tester has turned his motorcycle into a wifi war-bike. His custom Yamaha TRX 850 has been outfitted with wireless sniffing and attack tools, routers, a laptop, Raspberry Pi and even a heads up display (HUD) integrated within the bike helmet. Denis Andzakovic, a consultant with Security-Assessment.com and co-founder of Auckland-based Stray Rats Custom Motorcycles, modified his wheels to make wardriving a more nimble sport. "I wanted to combine two things that I really love: Building and riding motorcycles and trashing wireless networks," Andzakovic told delegates at Kiwicon 6. "The lack of subtlety with [wardriving] is something that really bothered me … you can't exactly park your SUV on the footpath in the middle of the CBD." Two satchels on both sides of the bike house Mikrotick routerboards, which perform sniffing and attacking functions, hitting both sides of the road as the bike passes. Each ran OpenWRT and Kismet drones that sniffed packets and sent them to BikeMind, a server running on a Sony Vaio netbook. A $45 GPS unit plugged into BikeMind and used GISKismet to plot access points on Google Maps. Dedicated attack and sniffing interfaces allow the two operations to run in tandem, making up for the lack of a keyboard. 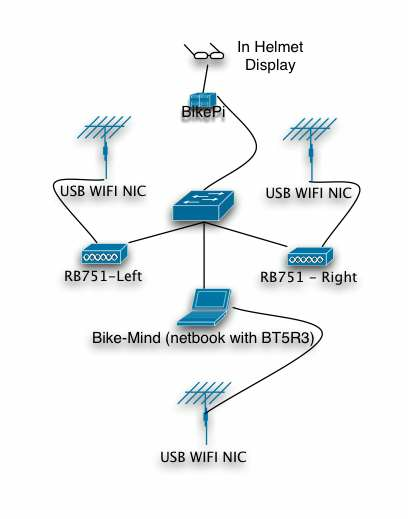 On the offensive side, processing scripts on Bikemind communicated with the routerboards. A dedicated attack interface used Python script to operate rogue access points and complicated attacks that could not be easily automated on the routerboards. Onboard, wireless was used as an access point for easy network administration via Hostapd and dhcp3-server. A Raspberry Pi, dubbed BikePi, was powered by the netbook and ran a tweaked Kismet into the helmet's HUD which itself ran within modified video glasses. The rider looking at the HUD saw a packet and data graph which indicated wifi-dense areas ripe for attack. The entire customised and sleek unit ran off a separate power supply that prevented the bike from running flat. Andzakovic said the system was designed to be easily adaptable to new software, was cheap to build, and had a long battery life. SC filmed the presentation below.